The paperback version of Dr. Hall's book is now available on www.amazon.com; the Kindle version is available here, and the Nook version from Barnes and Noble here. It is also in the iBookstore for iPad and iPhone. Although millions of babies are born perfectly healthy every day, the normal processes of pregnancy, labor and delivery can go awry. A baby’s genetic make-up may be flawed, his or her intrauterine environment may be inhospitable, birth may come too early, or illness may develop. Any one of these circumstances can unexpectedly propel a baby into the Neonatal Intensive Care Unit (NICU). FOR THE LOVE OF BABIES: One Doctor's Stories About Life in the Neonatal ICU invites readers into the NICU—an area in the hospital that’s unfamiliar and frightening to most people—and demystifies this place where extraordinary things transpire. The reader accompanies a number of babies with a range of medical concerns as they journey through the NICU, seeing the challenges each one must surmount, all the while getting a sense of life-and-death urgency that permeates NICU care. The all-important needs for parents to maintain hope, and for healthcare professionals to support them, are the transcendent messages. This is the book for anyone who’s ever wondered how parents whose babies are critically ill cope with the enormous emotional pressures facing them, and what the daily rhythms of life are like in a NICU. "FOR THE LOVE OF BABIES is a remarkable, moving and incredible piece of writing, not to mention a true addition to the literature we really need on the subject of NICUs, babies, doctors and parents." "Dr. Hall expertly and compassionately shares the courage, love and determination that can be found in a NICU. 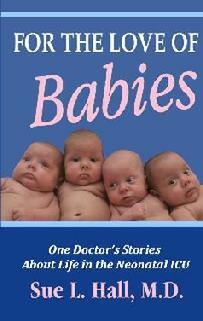 Each story is a testimony to the power of medical science and to the fighting spirit of even the smallest baby. At its core, FOR THE LOVE OF BABIES is about hope for each little survivor and his or her family, for increased understanding through research, and especially, hope for the day when fewer parents find themselves in the foreign, frightening world of NICUs as more babies are born full-term and healthy." "The short stories in this book are the essence of human compassion. The Neonatal Intensive Care environment is intense, frightening, intimidating and even overwhelming ,steeped in emotions of fear, anger, frustration, incomprehension, blame and loss. However, at the same time it is filled with understanding, love, hopefulness and professionalism. It is very clear that Dr Hall (unrelated) feels all of these emotions and has captured them in these pages. Her personal journey, experiences, and feelings are expressed compassionately and beautifully. Who should read this book? Everyone interested in neonatal intensive care, parents, supportive friends and relatives, nurses, medical students and residents, neonatologists and other members of the supporting staff. These stories convey the love and compassion which Dr Hall experiences and wishes to transmit to her readers." --Robert T. Hall, MD, Emeritus Professor of Pediatrics, University of Missouri-Kansas City School of Medicine, former Chief, Division of Human Development, Children's Mercy Hospital, Kansas City, MO. “From beginning to end, Dr. Hall speaks the language of the NICU with refreshing honesty. She provides insight into the neonatologist's world while describing dilemmas faced daily by those caring for our youngest and most fragile children. Writing with great empathy and power in every word of these stories about babies and their families, Dr. Hall shows readers that although life is not always fair, it is how you approach life that matters most." "FOR THE LOVE OF BABIES is a heartfelt collection of stories that every parent should read. This life-changing book is not only for those who are expecting children but for those who have been blessed with them. Pregnancy and birth are miraculous journeys, but they are not always journeys that every parent gets to enjoy. FOR THE LOVE OF BABIES is also for those parents who may retain healing, hope, honor and remembrance of the lost angels in their lives. Some of the stories explore an unexpected place in the journey of losing a baby where some families may find themselves. When a baby dies, a world is turned upside down. Fear, sadness, confusion, and shock are only a few of the deeper feelings that cannot be explained. FOR THE LOVE OF BABIES seeks to find solace in this uncertain space that provides no answers, no matter how hard one may try to find them. Although each story is profoundly different, I was touched by the love and agony and eventual hope each parent found for her baby. When I read FOR THE LOVE OF BABIES, I learned that life is not measured by the materials we possess, but rather, by the moments that help us grow by helping others." FOR THE LOVE OF BABIES was one of six finalists in the Strongest Start Competition on the website www.thenextbigwriter.com in the category of Memoir and Non-Fiction. "Loving Samantha," a chapter in the book, was one of 40 finalists out of 500 submissions for publication in an issue about End-of-Life Care in the journal Creative Non-Fiction. Dr. Hall's second book, which she is currently writing, is a novel entitled SUCH A SPECIAL GIFT. In this book, a delivery room disaster rips a family apart, as a woman serving as Surrogate Mother for her sister’s baby gives birth. Family members who are left grieving struggle to come to terms with what happened, to resolve their guilt, and to heal their wounded spirits. SUCH A SPECIAL GIFT is a story of love, of loss and of gratitude for the gifts we’ve been given.